Shawn Watson has been a longtime mainstay on our team here at Nautique. A pro wakeboarder hailing out of South Florida, when Watson made the move to Orlando almost 20 years ago he played a key role in the ride of the Pointless Posse and their major movement in wakeboarding. Ever since, he’s made a name for himself with his effortless style, seemingly endless successful pro model boards and a knack for living and breathing the wakeboarding lifestyle. During that entire long strange trip, it’s always been behind Nautiques for Watson. From his parents’ first ’94 model to the 2017 G23 that resides at his dock now, we’re proud to have played a part in the success of a long and illustrious career in wakeboarding. When and where did you get your start? I started wakeboarding around the age of 12 down in Lantana, Florida where I grew up. Who inspired you to wakeboard when you started? When I first started riding Byerly was God in wakeboarding. I watched every single one of his video parts and tried to imitate his riding whenever I got behind the boat. What was your first Nautique? That was a 1994 Ski Nautique my family owned (pictured below), and we eventually ended up with a 1997 Sport Nautique after that. What have been some of your career highlights? Winning Rookie of the Year in my 1st year on tour, 2-time Nautique National Champion, multiple Pro Tour wins, placing 3rd and getting 2nd twice at the Wake the Line rail events, and winning the Carnival Rail jam! What do you hold more dearly, being the first to land a 900 in a contest or your multiple Feet-on-Fire wins? That’s a tough one! Winning Feet on Fire was pretty all-time but landing a 900 in a contest was amazing. The 900 was at a double-up contest in Germany back in 1999 and I was last off the dock. Matt Staker was up before me and killed it with a grabbed heelside 720. I didn’t know what else to do at the time to one up him, I had never even thought of trying a 900 but decided to go for broke and give it a go in the contest; ended up stomping it and won the event! You’ve had a long career, what keeps the fire burning? It’s crazy to think that I signed my 1st contract with Liquid Force 20 years ago back in 1997! But I think what keeps the fire burning is that I still enjoy wakeboarding as much today as I did the very first day I started. What was the best thing about “the good old days” for you? Oh man, the best thing about the good old days were the trips and the friendships and relationships you make with teammates. Whether it was to Lake Powell with the Liquid Force crew, catalog shoots on Lake Tahoe for Nautique or back in the Monster days when we used to take house boat trips out on the Shushwap up in Canada. It was fun to be a part of those crews and the companies we represented, and not to mention the amazing times we all had! What’s better about being in the sport today? Well, I think it probably is the same with any sport with the progression of products. 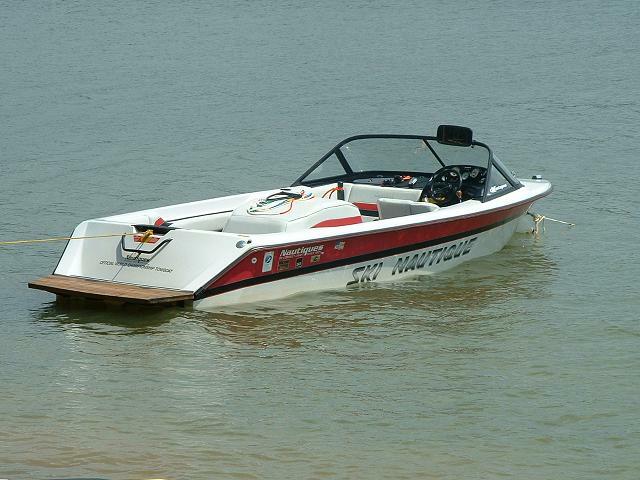 Back when I first started, I was riding behind a ‘’SKI’’ Nautique that was meant to put out the smallest wake possible. We were loading the boat down with as much weight as possible to create the best wake we could and doing as many tricks we were capable of. Now boats like the G23 that are designed for wakeboarding have incredible wakes and we have guys like Mike Dowdy doing multiple variations of double flips. It’s insane. We also have a crazy amount of cable parks and System 2.0s going up everywhere throughout the world making the sport more accessible to everyone and letting riders push the sport to higher levels. Is there someone who you’ve tried to model your career after? I said who inspired me in the first question, and I think Byerly rings true here too. I definitely looked up to quite a few guys growing up, but the two that have been the most important to me are Byerly and Shaun Murray. I still look up to those guys and have somewhat tried to follow in their footsteps. It’s really cool to see both of them over the age of 40 and still killing it. If you had to guess, how many boards have been sold with your name on it? Haha! Hmmm, that is a tough one! I had my 1st pro model back in 1999, there has been some years where we had 3 different shapes with up to 4 sizes in each shape so that would be so hard to even guess. I’m going to say around 25k, but I wouldn’t be surprised if it’s above that! Stick with one airline to build up status, get a credit card with that airline to help build that status and try to always sit up towards the front of the airplane (the further back you go is a bumpy ride and typically where the families with screaming babies tend to sit). Trick you want to learn? I’ve always wanted to learn some sort of double rotation. I’ve always been hesitant with previous knee injuries and not wanting to risk injuring again especially after all the injuries I have seen with guys this past year attempting them. I think this is going to be the year that I buckle down and get one though! Who are your typical riding buddies? Typical would be guys like Jim Lariche, Jeff Langley, Shane Bonifay, Massi and Chad Sharpe. What’s your favorite thing about living in Orlando? A typical day for me would be waking up (not crazy early but also not the type to sleep in), I’m a breakfast person so I enjoy making a solid breakfast. Then some sort of a workout, a bike ride or twice a week I’m in the gym with my personal trainer. Lunch, then depending on what the weather is like from there I’ll get out on the boat for an afternoon shred with some of the boys. That might followed up by a round of golf on the course that’s connected to my lake. And just before dark if the light is bangin’ then get out for another wakeboard session to get some photos taken. A proper meal and some downtime with the ol’ lady and call it a day! Any photo/video projects coming up? It’s the off-season right now so I’m in the planning stages of that. But I do plan to start my season off the beginning of March by going to Singapore for a film trip and from there to Australia to compete in the Nautique Moomba Masters and do some photo/video trips there for a few weeks to catch the end of their summer and come back home to the beginning of our warm weather! I’m looking forward to some amazing travel, and I’ve got a few new locations on the radar to tap into this summer to have an amazing time doing what I love to do every day!